The most deviant forms of human behaviour can be disturbing, incomprehensible, and sometimes very frightening. 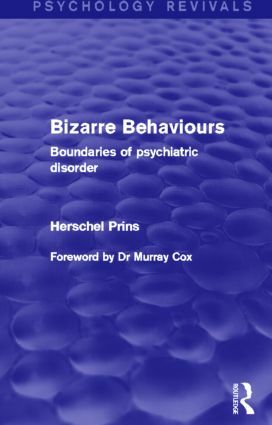 Herschel Prins believes that even the most deviant-seeming behaviours have their counterparts in ‘normality’ and can often be seen as an extension of this. In Bizarre Behaviours he sets some extreme forms of behaviour, such as vampirism and amok, in their socio-cultural and psychological contexts. Originally published in 1990, this very accessible and readable book will interest not only all those who have to deal with bizarre behaviour in the course of their work, but also the general reader who is interested in the origins and the infinite variety of human behaviours.